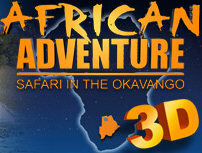 African Adventure 3D Safari in the Okavango is the latest 3D IMAX blockbuster to hit the shores of Australia that allows the viewer to experience the Okavango Delta as if they are almost there. Viewers are taken on one of the most amazing documentaries to date by South African zoologist Liesl Eichenberger and renowned wildlife filmmaker Tim Liversedge as they take us into the heart of the Okavango Delta where they showcase a variety of wild animals from lions to elephants and owls to crocodiles. Eichenberger and Liversedge truly draw the viewer into this documentary and mesmorises them, thanks to the 3D technology of this movie as it almost becomes an interactive experience. Seeing the graceful elephants of the Okavango Delta or the majestic lions, it's almost as if you can touch these beautiful creatures. The video quality of the presentation was phenomenal, especially the 3D cinematography as the creators take us on an amazing journey of this secluded 20,000 square kilometre of lagoons, channels and islands which is one of Earth's untouched paradises. Match that with realistic sound and I felt like a child again as I experienced something that I may never experience. One of the most memorable movie experiences of my entire life, highly Recommended!